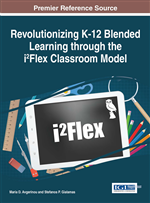 This chapter begins with a brief overview of blended learning in the K-12 in order to provide the theoretical framework for the i2Flex methodology and ground it on the larger educational landscape of the early 21st Century. The background, definition, and praxis of the methodology are then presented, followed by the conditions that are critical to its success. Specific reference is made to perspectives, instruments and processes that have served as pillars and guides for i2Flex, such as Boyer's scholarship of teaching (1990), TPACK (Mishra & Koehler, 2006), the Community of Inquiry (CoI) Framework (Garrison, et al., 2000), and the Quality Matters® course design standards and rubric. Early in the 21st Century, it has been recognized that the world has developed in such diverse directions and created new and particularly complex demands for citizenship, college and careers that it is no longer possible for old learning environments associated with old learning paradigms to accommodate them (Avgerinou, 2014). This realization has led to a pressing need for educational reform, and consequently to the development of a new vision for 21st Century learning (Dede, 2010; LEAP, 2007; NCREL & the Metiri Group, 2003; OECD, 2005; Partnership for 21st Century Skills, 2006; 2009; 2011). The Partnership for the 21st Century Skills framework (2006; 2009; 2011), the most detailed and widely adopted of all aforementioned, emphasizes that in addition to core subject knowledge, such skills as information and communication, inter-personal and self-directional, as well as being well versed with the technologies of this millennium, both from the consumer and the creator’s standpoints, are critical in order to prepare students as life-long learners to successfully cope with the demands of the ever changing world of the post-industrial era of information revolution. Redefine the overcrowded curriculum of the past century in alignment with the demands of the new era. Play: The capacity to experiment with one’s surroundings as a form of problem solving. Simulation: The ability to interpret and construct dynamic models of real-world processes. Multitasking: The ability to scan one’s environment and shift focus as needed to salient details. Judgment: The ability to evaluate the reliability and credibility of different information sources. Trans-Media Navigation: The ability to follow the flow of stories and information across multiple modalities. Networking: The ability to search, synthesize, and disseminate information. Negotiation: The ability to travel across diverse communities, discerning and respecting multiple perspectives, and grasping and following alternative norms.